ANCA vasculitis has an associated autoimmune response that produces ANCAs that induce distinct pathologic lesions. Pauci-immune necrotizing and crescentic GN is a frequent component of ANCA vasculitis. ANCA vasculitis is associated with ANCA specific for myeloperoxidase (MPO-ANCA) or proteinase 3 (PR3-ANCA). A diagnosis of ANCA vasculitis should always specify the serotype as MPO-ANCA positive, PR3-ANCA positive, or ANCA-negative. To fully characterize a patient, the serotype also should be accompanied by the clinicopathologic variant if this can be determined: microscopic polyangiitis, granulomatosis with polyangiitis (Wegener), eosinophilic granulomatosis with polyangiitis (Churg–Strauss), or renal-limited vasculitis. ANCA vasculitis is most prevalent in individuals >50 years old. There are racial/ethnic and geographic influences on the prevalence, serotype frequencies, and clinicopathologic phenotypes. There is clinical, in vitro, and animal model evidence that ANCAs cause disease by activating neutrophils to attack small vessels. Immunomodulatory and immunosuppressive therapies are used to induce remission, maintain remission, and treat relapses. Over recent years, there have been major advances in optimizing treatment by minimizing toxic therapy and utilizing more targeted therapy. GN and vasculitis caused by ANCAs is the most common form of new-onset GN in adults >50, although it can occur at any age. Prompt diagnosis and initiation of appropriate immunosuppressive therapy is essential for optimum patient and renal outcomes. Diagnosis and treatment of ANCA disease is complicated by the marked differences in symptoms, signs, activity, chronicity, and severity among patients. This review will summarize the spectrum of clinicopathologic phenotypes and serotypes of ANCA disease, the related epidemiologic and demographic characteristics, the underlying pathogenic mechanisms, and the current approaches to treatment. ANCA GN and vasculitis are defined by distinct pathologic lesions and an associated autoimmune response that produces ANCAs. The 2012 Chapel Hill Consensus Conference Nomenclature of Vasculitides (CHCC 2012) defines ANCA-associated vasculitis as necrotizing vasculitis, with few or no immune deposits, predominantly affecting small vessels (i.e., capillaries, venules, arterioles, and small arteries) (Table 1) (1). ANCA vasculitis is associated with ANCA specific for myeloperoxidase (MPO-ANCA) or proteinase 3 (PR3-ANCA). On the basis of pathologic and clinical features, ANCA-associated vasculitis is subdivided into microscopic polyangiitis (MPA), granulomatosis with polyangiitis (Wegener) (GPA), and eosinophilic granulomatosis with polyangiitis (Churg–Strauss) (EGPA) (Table 1), as well as renal-limited vasculitis (RLV) with pauci-immune necrotizing GN alone with no evidence for systemic vasculitis (1). Unlike MPA, GPA has extravascular granulomatous inflammation, most often in the respiratory tract. EGPA has extravascular granulomatous inflammation as well as blood eosinophilia and asthma. Less than 10% of patients with clinical and pathologic features of MPA, GPA, RLV, and EGPA with necrotizing GN are negative for ANCA using current clinical assays. To be most helpful for clinical management, an ANCA disease diagnosis in a given patient should include both the serotype and the clinicopathologic phenotype, if known. For example, CHCC 2012 calls for adding a prefix to the clinicopathologic phenotype indicating the ANCA specificity in a given patient with ANCA-associated vasculitis (i.e., MPO-ANCA GPA, PR3-ANCA MPA, ANCA-negative MPA, etc.) (1). Pauci-immune necrotizing and crescentic GN is the typical pattern of glomerular injury in all forms of systemic ANCA-associated vasculitis (2). ANCA-associated pauci-immune necrotizing and crescentic GN also occurs in the absence of systemic vasculitis as so-called RLV. The characteristic acute lesion in glomeruli as well as other vessels in the kidney and throughout the body is localized vessel wall necrosis, which releases constituents of the plasma, including coagulation factors, into the necrotic zone where thrombogenic factors, such as tissue factor, activate the coagulation cascade to produce fibrin. This necrotic area filled with fibrin is called fibrinoid necrosis (Figure 1). Unlike immune complex GN and anti–glomerular basement membrane (anti-GBM) crescentic GN that have extensive localization of immunoglobulin in glomeruli detected by immunofluorescence microscopy, ANCA GN has a paucity of staining for immunoglobulin in glomeruli (2). The pathologic activity and chronicity of ANCA GN can be classified by Berden et al. (3) on the basis of the extent of glomerular crescents and sclerosis, and the proportion of glomeruli with no lesion by light microscopy. Focal class with ≥50% normal glomeruli has the least progression to ESRD, sclerotic class with ≥50% globally sclerotic glomeruli has the worst progression, and crescentic class with ≥50% glomerular crescents and mixed class with no predominance of a lesion type have intermediate progression (3). A caveat is that in patients with eGFR<15 ml/min per 1.73 m2, the Berden class does not predict renal outcome (4). In this setting, normal glomeruli ≤10% (P=0.04) and higher overall chronicity score (P=0.02) are risk factors for ESRD. Serologic classification of ANCA-associated vasculitis (e.g., MPO-ANCA, PR3-ANCA, ANCA-negative) as well as clinicopathologic classification (e.g., MPA, GPA, EGPA, RLV), and combinations of both, are useful for characterizing the nature and outcome of the disease in a given patient, and for predicting the prognosis and response to treatment (5,6). When used in patient management, ANCA testing should be performed by a clinical laboratory that can determine ANCA specificity for PR3 and MPO (7). Accurate assays for ANCA are valuable for diagnosis and prognostication (8); however, ANCA titers are more predictive of renal disease activity than nonrenal disease activity (9). Patients with ANCA GN who become ANCA negative during follow-up have low risk for relapse, and a rise in ANCA titer increases the likelihood of relapse >11 times (9). Classifying patients on the basis of PR3-ANCA versus MPO-ANCA correlates with a number of disease characteristics (10). PR3-ANCA vasculitis is more common in northern Europe, northern North America, and Australia; whereas MPO-ANCA vasculitis is more common in southern Europe, southern United States, and Asia. PR3-ANCA has an HLA-DP genetic association whereas MPO-ANCA vasculitis has an HLA-DQ association. PR3-ANCA vasculitis has more upper respiratory tract disease whereas MPO-ANCA vasculitis has more renal disease. PR3-ANCA vasculitis has more granulomatous inflammation and MPO-ANCA vasculitis less granulomatous inflammation. At the time of biopsy, PR3-ANCA GN has more necrosis and MPO-ANCA GN has more sclerosis. Our data from the University of North Carolina (UNC) indicate that ANCA specificity independently predicts relapse among patients with ANCA vasculitis more effectively than classification systems that use only the clinicopathologic phenotype, with PR3-ANCA–positive patients approximately twice as likely to relapse compared with MPO-ANCA–positive patients (hazard ratio, 1.89; 95% confidence interval, 1.33 to 2.69; P<0.001) (5). ANCA specificity has the best predictive model fit compared with classification on the basis of the CHCC 2012 definitions (1), or the European Medicines Agency classification (11). Tables 2 and 3 show demographic and selected clinical data from an inception cohort of ANCA vasculitis patients primarily from the southeastern United States seen at UNC between 1985 and 2007 (5). This cohort came from a nephrology-based clinical setting, and thus is skewed toward patients encountered by nephrologists. This cohort included 502 ANCA-positive patients diagnosed with biopsy-confirmed ANCA vasculitis (including MPA, GPA, and RLV, but excluding EGPA) followed by the Glomerular Disease Collaborative Network. Patients with EGPA are rarely seen by nephrologists at UNC. Patients received conventional therapies (5). Figure 2, which shows organ system involvement in this cohort, demonstrates that the MPO-ANCA and PR3-ANCA serotypes correlate with different predilections for organ involvement (5). At one extreme are RLV patients with GN as the only expression of vasculitis, with approximately 80% of patients MPO-ANCA positive. At the other extreme are patients with destructive lesions in the nasal septum with >90% positivity for PR3-ANCA. Patients with pulmonary capillaritis and no nodules or cavities have a similar frequency of MPO-ANCA and PR3-ANCA, whereas patients with lung nodules or cavities more often have PR3-ANCA. Patient characteristics on the basis of clinicopathologic phenotype (RLV, MPA, GPA) of an inception cohort of patients with ANCA vasculitis with high-frequency renal involvement evaluated at the University of North Carolina Kidney Center (excluding patients with eosinophilic granulomatosis with polyangiitis). The proportion of patients with each characteristic (other than age) is expressed as a percent of RLV patients, MPA patients and GPA patients. Patient characteristics on the basis of ANCA specificity (MPO-ANCA, PR3-ANCA) of an inception cohort of patients with ANCA vasculitis with high-frequency renal involvement evaluated at the University of North Carolina Kidney Center (excluding patients with eosinophilic granulomatosis with polyangiitis). The proportion of patients with each characteristic (other than age) is expressed as a percent of all ANCA disease patients, MPO-ANCA disease patients and PR3-ANCA disease patients. 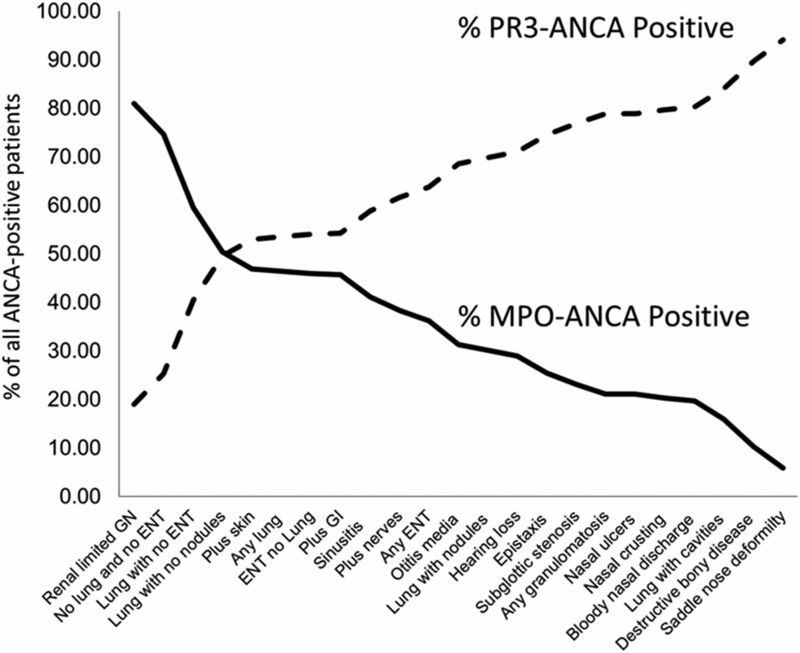 Frequency of PR3-ANCA and MPO-ANCA positivity in ANCA-positive patients with a particular organ system involvement in an inception cohort of 502 ANCA vasculitis patients with MPA, GPA, or RLV evaluated at the University of North Carolina Kidney Center (excluding patients with EGPA) (Modified from Lionaki et al. ). Organ groupings are not mutually exclusive. ‘No lung and no ENT’ has vasculitis in some other organs. Plus means there is vasculitis in an additional organ. EGPA, eosinophilic granulomatosis with polyangiitis; ENT, ear, nose and throat; GI, gastrointestinal tract; GPA, granulomatosis with polyangiitis; MPA, microscopic polyangiitis; MPO-ANCA, ANCA specific for myeloperoxidase; PR3-ANCA, PR3-ANCA, ANCA specific for proteinase 3; RLV, renal-limited vasculitis. MPA, GPA, and EGPA have a peak incidence of 65–75, but may occur at any age, with a slight male predominance (12). Figure 3 shows data derived from 21,374 patients with any form of glomerular disease identified in renal biopsy specimens evaluated by the University of North Carolina Nephropathology Laboratory from 1986 to 2015 (13). Only a subset of the most common glomerular disease categories that cause GN are shown on these graphs. In patients with GN <60 years old, lupus nephritis and IgA nephropathy are diagnosed most often, whereas ANCA GN is diagnosed most often after 60 years old (13). As a percentage of all biopsies performed in different age groups (panel on the right in Figure 3), IgA nephropathy declines with age, lupus nephritis peaks in early adulthood, and ANCA GN increases with age, with a dramatic surge after 50 years old. These data are derived from 21,374 patients with any form of glomerular disease identified in renal biopsy specimens evaluated by the University of North Carolina Nephropathology Laboratory from 1986 to 2015. 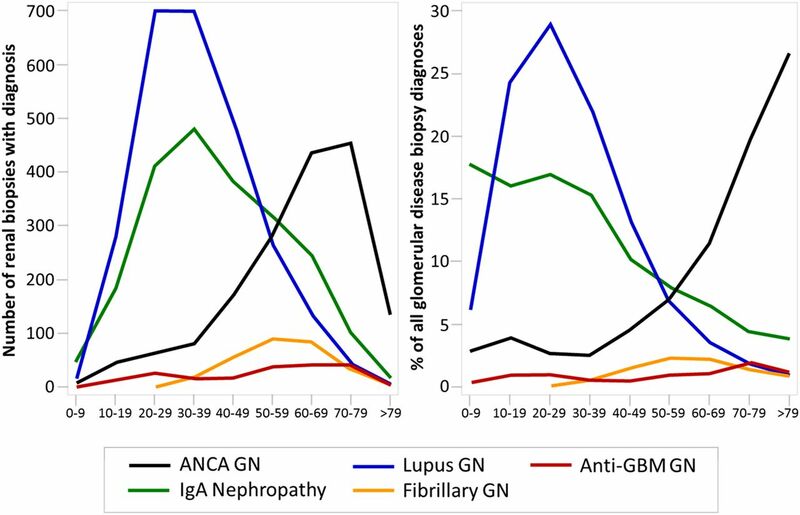 Only a subset of the most common glomerular disease categories that cause GN are shown on these graphs (modified from reference 13, with permission). Anti-GBM GN, anti–glomerular basement membrane GN. ANCA vasculitis has geographic and race/ethnic differences in prevalence (12). In the United Kingdom, GPA is more prevalent than MPA (148 versus 65 per million), and EGPA is least prevalent (46 per million). ANCA vasculitis prevalence in France is higher in people with European lineage compared with non-European lineage (105 per million versus 53 per million). In North America, ANCA vasculitis incidence is greater in whites than in blacks, which may be caused by HLA differences (14). ANCA vasculitis is less common in blacks, occurs at a younger age (mean 52 versus 57 years), and is more often MPO-ANCA positive compared with whites (71% versus 54%) (15). There are no differences compared with whites in treatment response, ESRD, renal relapse, or death. In the United Kingdom and northern Europe, PR3-ANCA and GPA are more common than MPO-ANCA; however, in southern Europe, Asia, and India, MPO ANCA and MPA are more common than PR3-ANCA and GPA (12). In the United States, there is a similar trend with more PR3-ANCA and GPA in northern states and more MPO-ANCA-and MPA in southern states. In China, GPA patients more often have MPO-ANCA than PR3-ANCA. Geographic and racial differences in serotypes and clinicopathologic phenotypes may be determined by HLA differences (14,16,17). Although only approximately 50% of patients with EGPA have ANCA, which is usually MPO-ANCA, the presence of ANCA correlates with phenotypic features of vasculitis including GN, alveolar capillaritis, and peripheral neuropathy (12). The GN in MPA, GPA, EGPA, and RLV is histologically indistinguishable (2). The demographic data in Tables 2 and 3 are representative of ANCA-positive patients with ANCA vasculitis in the southeastern United States (5). Among these patients, approximately a quarter have RLV, a quarter have GPA, and half have MPA. MPO-ANCA occurred in 81% of RLV, 59% of MPA, and 26% of patients with GPA. Conversely, PR3-ANCA occurred in 19% of RLV, 41% of MPA, and 74% of patients with GPA. During the time when this cohort of patients was identified, <5% of patients at UNC with clinical and pathologic features of ANCA vasculitis were ANCA-negative. These patients are not included in Tables 2–4. Patients with concurrent ANCA and anti-GBM disease also were not included. Approximately 5% of patients with ANCA vasculitis also have anti-GBM antibodies, and approximately 35% of patients with anti-GBM disease have ANCA (usually MPO-ANCA) (18). These patients have kidney disease that more closely resembles anti-GBM disease, i.e., it is more severe pathologically and clinically, and the risk of progression to ESRD is greater than for ANCA GN in the absence of anti-GBM. Table 4 demonstrates responses to treatment of a large ANCA vasculitis cohort managed by nephrologists in the southeastern United States from 1985 to 2007 (5). The outcome data represent blended results derived from different conventional treatment approaches among different nephrologists over several decades. Nevertheless, we believe that these data provide an informative overview of the spectrum of patients with ANCA vasculitis encountered by nephrologists. Note that classification by both ANCA serotype and clinicopathologic phenotype have statistically significant correlations with demographic and clinical parameters (Tables 2–4). For example, in this cohort, 81% of patients with RLV have MPO-ANCA compared with 59% of patients with MPA and 26% of patients with GPA (Table 2). From another perspective, 35% of patients with MPO-ANCA have RLV compared with 10% of patients with PR3-ANCA (Table 3). Table 4 shows that both serotype and phenotype correlate with outcomes. For example, relapse rates are 19% for RLV, 37% for MPA, and 60% for GPA using CHCC 2012 definitions; and 51% for patients with PR3-ANCA and 29% for patients with MPO-ANCA. There is clinical, animal model, and in vitro experimental evidence that ANCAs are pathogenic (19). The presence of ANCAs in >90% of patients with MPA, GPA, and RLV raises the possibility that ANCAs are causing the disease. The efficacy of immunosuppressive and immunomodulatory therapy in ANCA vasculitis, and the rough correlation of ANCA titers with response to therapy and relapse, also support an immune pathogenesis. The utility of plasmapheresis and targeted B cell therapy (e.g., rituximab) suggests a primary pathogenic role for autoantibodies. ANCA pathogenicity also is supported by the observation in one neonate that transplacental transfer of maternal MPO-ANCA to the child was associated with development of nephritis and pulmonary hemorrhage (20). Some drugs, such as hydralazine, propylthiouracil, penicillamine, and illicit cocaine adulterated with levamisole can induce ANCA vasculitis (21). This induction of ANCAs followed by onset of ANCA vasculitis supports a causal relationship. However, these associations do not prove causality, and the presence of an ANCA vasculitis disease phenotype in patients who are ANCA-negative by current clinical assays, and the persistence of ANCA positivity in some patients in remission, raises doubts about the pathogenic link between ANCAs and ANCA vasculitis. One possible explanation for these inconsistent serologic correlations is that some ANCA epitope specificities are not pathogenic and thus ANCAs with these specificities can be present in the absence of active disease, and that some ANCA are specific for autoantigen epitopes that are not detected in current serologic assays for ANCA. Experimental evidence for both possibilities was reported by Roth et al. (22) who observed that MPO-ANCAs with certain epitope specificities only occur in patients with active disease, whereas other MPO-ANCA epitope specificities occur not only in patients with active disease, but also in patients in remission and even in very low titers in healthy controls as natural autoantibodies. Roth et al. (22) also observed that an MPO epitope recognized by some pathogenic MPO-ANCAs could not be detected in usual serologic assays but only in assays that eliminated a serum blocking factor by using isolated IgG. The most compelling evidence for induction of ANCA vasculitis by ANCAs comes from in vitro and in vivo experiments (19,23). Figure 4 depicts a putative sequence of pathogenic events that is consistent with in vitro and in vivo animal model experiments, and supported by clinical observations. Each localized vascular lesion resulting from this process progresses from an acute to a chronic phase within 1 or 2 weeks; however, multiple new acute lesions in multiple vessels continue to develop until patients enter remission. Thus, patients with active disease have accrued chronic lesions as well as newly developing acute lesions. This is observed in most ANCA GN renal biopsy specimens as varying numbers of glomeruli with acute necrotizing lesions (usually accompanied by crescents), sclerotic lesions, or both (2). Diagram depicting the pathogenesis of vascular lesions in ANCA vasculitis and GN. The events from left to right occur sequentially at each site of injury, and are repeatedly initiated at multiple sites until induction of remission. 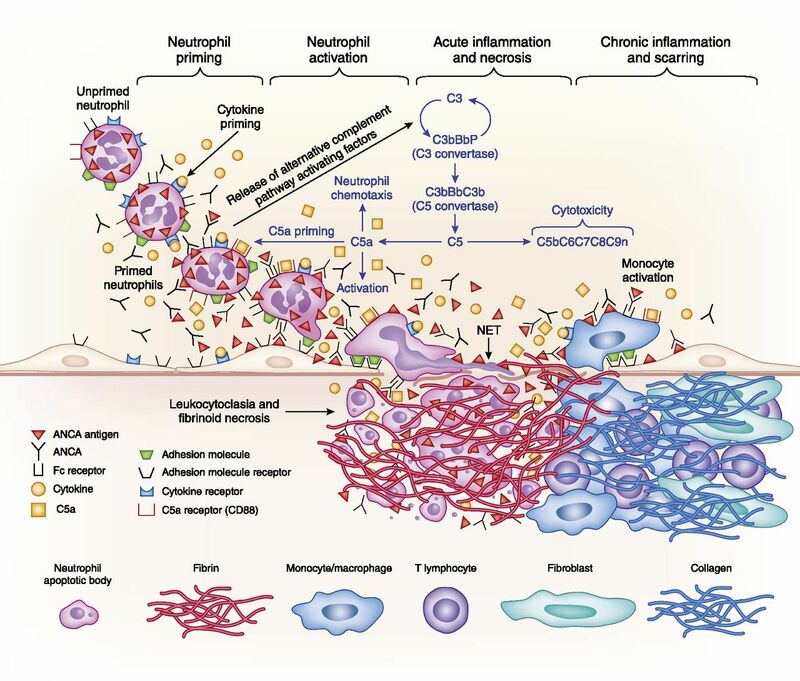 Neutrophil priming, for example by cytokines generated by a synergistic infection, primes neutrophils and presents ANCA antigens at the surface and in the microenvironment of neutrophils. ANCA-activated neutrophils adhere to and penetrate vessel walls, and release destructive inflammatory mediators and undergo NETosis. ANCA-activated neutrophils release factors that activate the alternative complement pathway, which generates C5a and amplifies the inflammation by attracting and priming more neutrophils. At sites of vessel wall disruption, plasma spills into the necrotic zone and coagulation factors are activated to produce fibrin, resulting in a fibrinoid necrosis in vessels in tissue and crescents in glomeruli. Leukocytes undergo apoptosis and necrosis producing leukocytoclasia. Within a few days, the acute inflammation and necrosis is replaced by infiltrating macrophages and lymphocytes, and scarring begins as activated fibroblasts and myofibroblasts lay down collagen. (Shown only at the right side of the acute lesion is monocyte activation by ANCA, which is occurring in parallel with neutrophil activation at all sites of acute injury.) NET, neutrophil extracellular trap. Both MPO-ANCA and PR3-ANCA IgG can activate primed normal human neutrophils in vitro causing respiratory burst with release of toxic oxygen radicals, degranulation with release of lytic and proinflammatory enzymes, release of complement alternative pathway–activating factors, and release of neutrophil extracellular traps (NETS), which contain extruded DNA with adherent cytoplasmic proteins that can cause tissue injury and augment the autoimmune response (19,23,24). Priming of neutrophils, for example by cytokines, is required for optimum activation by ANCA IgG. Priming causes a minor degree to ANCA autoantigens translocation from the cytoplasm to the cell surface where the autoantigens can interact with ANCAs. In in vitro and in vivo animal models, tumor necrosis factor suffices as a priming factor. In patients, neutrophil priming for activation by circulating ANCA could be caused by a concurrent synergistic infection, for example a respiratory tract viral infection. Priming causes neutrophils to increase the availability of ANCA antigens on their surfaces, where they are accessible to interact with ANCAs. Neutrophils are activated when ANCA IgG bound to ANCA antigens engages Fc γ receptors on the surface of neutrophils. ANCA-activated neutrophils adhere to endothelial cells and release mediators of inflammation and cell injury, including NETS (19,24) (Figure 4). Multiple animal models have been used to demonstrate the pathogenicity of MPO-ANCAs and also to incriminate a role for T cells (23,25–27). Interestingly, no convincing animal model of ANCA vasculitis caused by PR3-ANCA has been developed. This is probably because of the difference in the biology of PR3, including the amount produced, between humans and the experimental animals that have been used to attempt to cause disease with anti-PR3 antibodies (28). One animal model that has been reproduced in multiple labs was first reported by Xiao et al. (25) and entails injection of mouse anti-MPO antibodies into susceptible strains of mice resulting, within one week, in pauci-immune necrotizing and crescentic GN, and small vessel vasculitis in other organs. In this model, there is no difference in disease induction in wild-type mice compared with mice with no functioning T cells (25). Thus, T cells are not required to induce acute necrotizing vascular injury. Of course, T cells are undoubtedly critically important in initiating and regulating the autoimmune ANCA response in patients, and in the inflammatory response to injury, even if they are not involved in causing the acute lesions. Multiple studies using the mouse model induced by anti-MPO IgG have shown that disease is mediated by neutrophil activation, prevented by neutrophil depletion, influenced by genetic background, modulated by Fc γ receptor repertoire, and requires inflammatory amplification by the alternative complement pathway (23) Unexpectedly, activation of the alternative complement pathway was found to play an important role in amplifying ANCA-induced inflammation (29,30). ANCA-activated neutrophils release factors that activate the alternative complement pathway, resulting in the generation of C5a that is strongly chemotactic for neutrophils and primes neutrophils to facilitate further activation by ANCAs (29,30). Observations in patients with ANCA disease support a role for complement in pathogenesis. Gou et al. (31) observed changes in the levels of complement components, including activation fragments, in the circulation of patients with ANCA vasculitis that substantiate alternative complement pathway activation in patients with ANCA vasculitis. They observed that patients with ANCA vasculitis have increased plasma levels of alternative pathway activation markers C3a, C5a, soluble C5b-9, and Bb during active disease but not remission. The plasma level of Bb correlated with severity of glomerular injury on the basis of percentage of cellular crescents in renal biopsy specimens and with Birmingham Vasculitis Activity Scores (31). Clinical trials are currently underway to evaluate the value of complement activation blockade in the treatment of ANCA vasculitis. Careful studies of renal biopsy specimens from patients with ANCA GN confirm the presence of many of the mediators incriminated in animal studies, and illustrated in Figure 4. For example, in one study of MPO-ANCA GN biopsy specimens, active lesions contained neutrophils, monocytes, macrophages, T cells, NETS, and cellular and extracellular MPO, including MPO decorating NETS (32). There is a general understanding of the likely pathogenic events that cause vascular injury. However, there is less understanding of the initial cause for the autoimmune response that results in ANCA production. Adaptive immune responses begin with presentation of antigens to the immune system in the antigen-presenting pocket of HLA molecules, which will present the antigen to the T cell receptor, which in turn influences the specificity of the B cell receptor (i.e., the immunoglobulin molecule). This predicts that different HLA molecules would be involved in initiating the MPO-ANCA autoimmune response versus the PR3-ANCA autoimmune response. This was in fact observed in patients with ANCA vasculitis by genome-wide association studies that showed specific, and different, HLA associations with MPO-ANCA and PR3-ANCA vasculitis (16,17). Not surprisingly given their lineal role in immune responses, the HLA associations correlated better with ANCA specificity than with clinicopathologic phenotypes. Another genetic influence that may affect the genesis of an immune response, or the intensity of pathogenic event, is epigenetically controlled increased expression of ANCA autoantigens. The MPO and PRTN3 genes in peripheral blood neutrophils and monocytes, that produce MPO and PR3, respectively, are overexpressed in patients with active ANCA vasculitis compared with patients in remission and healthy controls, as a result of epigenetic dysregulation (33). Increased expression of MPO and PR3 genes may influence disease pathogenesis either by augmenting ANCA-induced neutrophil activation, or stimulating the pathogenic autoimmune response, or both. ANCA-induced neutrophil activation causes NETosis. NETosis is a form of neutrophil activation and cell death that results in the release of NETS that contain a framework of extruded DNA from decondensed chromatin decorated with multiple adherent cytoplasmic proteins, including MPO and PR3, many of which have antimicrobial properties. NETosis could contribute to the pathogenies of ANCA disease, both by presenting PR3 and MPO proteins to the immune system in a way that facilitates the autoimmune ANCA response, and by mediating inflammatory injury at sites of ANCA-induced activation through destructive enzymes and complement-activating factors (24). Another hypothetic mechanism for initiating an ANCA autoimmune response entails an initial response to complementary (antisense) peptides that induces anti-idiotypic antibodies that react with sense peptides (autoantigen epitopes) (34). Both antibodies (34) and T cells (35) specific for complementary PR3 have been detected in patients with ANCA vasculitis. Evaluation of the functional significance of ANCA vasculitis genome-wide association study data also suggested a role for immune recognition of complementary peptides by T cells (17). Although the mechanisms are not fully elucidated, both the adaptive and innate immune systems clearly are responsible for causing ANCA vasculitis. Thus, appropriate immunosuppression and immunomodulation therapy are likely to ameliorate ANCA vasculitis injury. For decades, conventional treatment of ANCA disease with major organ involvement has been with high-dose cyclophosphamide and glucocorticoids, which has induced remission in approximately 75% of patients at 3 months and up to 90% at 6 months, although relapses and adverse side effects were frequent. More recently, new treatment regimens have been developed to limit cyclophosphamide and glucocorticoid exposure during both the induction and maintenance phases. Biologic therapies that target specific cellular and molecular components of the autoimmune response and the mediators of inflammatory injury may be more effective and less toxic. Timely diagnosis and institution of appropriate immunomodulatory therapy is critically important for optimum renal outcome in patients with ANCA GN; however, patients often have delay in diagnosis and treatment because of delay in referral to a nephrologist by a primary care physician, and by patients not going to physicians at the onset of symptoms. In a study of 127 patients with ANCA GN by Poulton et al. (36), 71% had a delay in primary care physician referral to a nephrologist, and 57% of patients who delayed seeking care had a delay in diagnosis and appropriate treatment. Patients with initial flu-like or upper respiratory tract symptoms were more likely to have a delay in diagnosis, perhaps because these symptoms suggested common nonprogressive infections to the patient and the primary care physician. The most widely used current induction therapy comprises cyclophosphamide combined with glucocorticoids (Figure 5). The optimum dose, duration, and route of administration of cyclophosphamide and rituximab therapy have been studied in multiple clinical trials (e.g., 37–40). There is no randomized trial to guide dosage of glucocorticoids. There is no universal consensus on optimum treatment regimens. A major issue has been the relative efficacy of daily oral versus pulse intravenous (iv) cyclophosphamide, and comparative toxicity of each. The Cyclophosphamide Oral versus Pulse Trial (CYCLOPS) evaluated 149 patients with GPA or MPA who received either oral (2 mg/kg per day; maximum oral dose 200 mg) or iv pulse cyclophosphamide (15 mg/kg; maximum pulse dose 1.2 g), initially every 2 weeks for the first three pulses then every 3 weeks for the next three to six pulses. The two treatment groups had no difference in time to remission, renal survival, mortality, or adverse events (37,38). Although the rate of relapse was approximately twice as high in the iv group after long-term follow-up, there were no differences between the groups with respect to renal and patient outcomes. This may favor the use of iv pulses because of the reduced cumulative dose of cyclophosphamide. Vigilance for leukopenia and infections is prudent with cyclophosphamide therapy. High cumulative dose of cyclophosphamide should be avoided by using alternative therapies for induction of remission, maintenance of remission, and treatment of relapses. 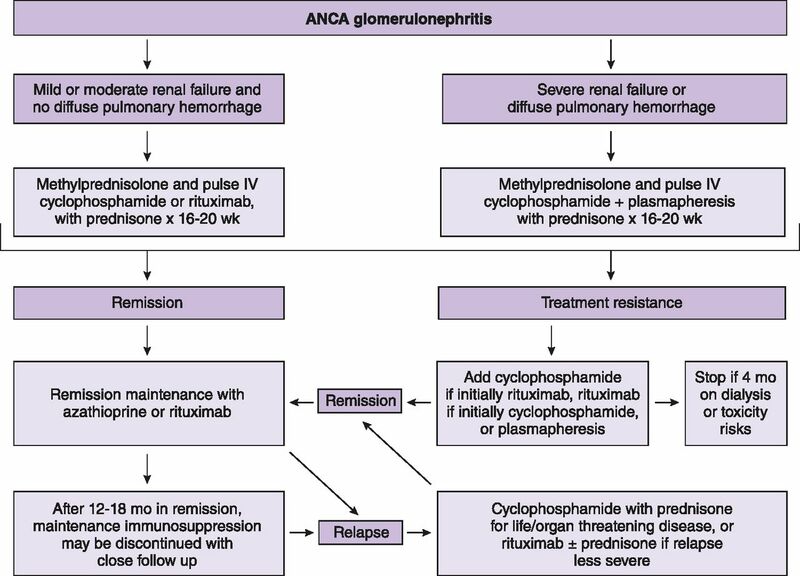 ANCA vasculitis treatments algorithm in accord with current practice at the University of North Carolina Kidney Center. IV, intravenous. Initial high-dose iv or oral glucocorticoid administration is followed by tapering does of oral prednisone. The dose and duration of prednisone therapy varies, and may be influenced by the rate and extent of disease remission. A meta-analysis concluded that longer courses of glucocorticoids are associated with fewer relapses (41). Our goal is to discontinue prednisone after 4–5 months if remission has been induced. Continuing prednisone beyond 6 months is associated with increased risk of infection, and may not provide significant benefit (42). Targeted B cell therapy to eliminate pathogenic ANCA is conceptually attractive because this could selectively reduce antibody production while preserving other adaptive and innate immune cells. Rituximab, which is an mAb that targets CD20 on B cells, is an alternative to cyclophosphamide. Two controlled prospective clinical trials, Rituximab versus Cyclophosphamide for ANCA-associated Vasculitis (RAVE), and Rituximab versus Cyclophosphamide in ANCA-associated Renal Vasculitis (RITUXIVAS), have demonstrated the value of targeted B cell therapy with rituximab in induction therapy for ANCA disease (39,40), which led to Food and Drug Administration approval for induction therapy. In the RITUXIVAS trial, patients in the rituximab group also received iv cyclophosphamide, whereas in the RAVE trial, patients in the rituximab group did not receive cyclophosphamide. All patients in both trials received iv and oral glucocorticoid therapy. Patients in the RITUXIVAS trial had more severe kidney disease. Both trials showed that rituximab was noninferior for inducing remission compared with iv cyclophosphamide (RITUXIVAS trial) or oral cyclophosphamide (RAVE trial). Adverse events were not reduced in the patients treated with rituximab in either trial. A biomarker that can guide rituximab therapy would be valuable. Bunch et al. (43) have observed that the percentage of peripheral blood CD5-positive regulatory B cells is a useful indicator of disease activity, remission, and future relapse after rituximab therapy, and thus may help measure the effectiveness of induction therapy and guide maintenance therapy vigilance for relapse. To our knowledge, assays for CD5-positive B cells are not routinely available in clinical laboratories, although this test could be added to current flow cytometry lymphocyte phenotyping assays as a locally validated laboratory-developed test. Plasmapheresis is another strategy to remove pathogenic ANCA, as well as inflammatory mediators, from the circulation. Plasmapheresis has been shown to have a therapeutic effect in patients with ANCA disease (including ANCA plus anti-GBM disease) who have severe renal impairment (serum creatinine >6 mg/dl or requiring dialysis), and those with alveolar hemorrhage (44,45). The MEPEX (Methylprednisolone versus Plasma Exchange Trial) evaluated patients with severe renal disease (serum creatinine >5.8 mg/dl) treated with oral cyclophosphamide and glucocorticoids, and either plasmapheresis or pulse iv methylprednisolone (46). Plasmapheresis was associated with increased rate of renal recovery compared with methylprednisolone at both 3 and 12 months of follow-up. Severe adverse event rates and patient survival were similar in both groups. The Plasma Exchange and Glucocorticoids for Treatment of ANCA-Associated Vasculitis trial (PEXIVAS) is underway to evaluate plasma exchange in patients with GPA or MPA with pulmonary hemorrhage and/or severe renal disease (47). All patients will receive standard induction therapy with cyclophosphamide or rituximab. Patients will be randomized to receive seven plasma exchanges and either standard or low-dose glucocorticoids, or no plasma exchange and either standard or low-dose glucocorticoids (47). The goal is to determine whether plasma exchange combined with immunosuppressive therapy is effective in reducing death and ESRD. The trial will also study whether low-dose glucocorticoid therapy is as effective as standard glucocorticoid therapy. Once remission has been induced, continued lower-level immune suppression is needed for most patients to prevent relapse, which usually entails low-dose glucocorticoids plus an additional immunomodulatory therapy such as azathioprine, rituximab, or mycophenolate mofetil (MMF) for 12–18 months. Patients with PR3-ANCA or GPA are more likely to relapse than patients with MPO-ANCA, MPA, or RLV (Table 4). Maintenance therapy may be for a shorter interval or not required for patients at low risk for relapse, such as patients with MPO-ANCA who have complete remission and are MPO-ANCA negative. More prolonged maintenance may be appropriate for patients with increased risk for relapse, such as PR3-ANCA positivity, prior recurrence, and pulmonary involvement. Sustained use of cyclophosphamide is not recommended because of toxicity. A randomized controlled trial comparing cyclophosphamide for 12 months with maintenance therapy with azathioprine once complete remission is attained demonstrated no difference in outcome including relapse rate (48,49). Compared with azathioprine, maintenance therapy with MMF was associated with a significantly higher rate of relapse (50,51). Nevertheless, MMF remains an option for maintenance therapy in patients who are intolerant or allergic to azathioprine. Methotrexate may be useful in maintaining remission in patients with mild disease and no renal impairment. Rituximab is another option for maintenance of remission. The Maintenance of Remission using Rituximab in Systemic ANCA-associated vasculitis trial (MAINRITSAN) compared rituximab (500 mg iv every 6 months) to azathioprine for remission maintenance in patients with MPA, RLV, and GPA in complete remission after induction treatment with a cyclophosphamide and glucocorticoid regimen (50). Rituximab was better than azathioprine for preventing relapse, including renal relapse. The optimum duration of maintenance therapy depends on multiple factors. Ending too soon increases the risk of relapse. Patients with PR3-ANCA (versus MPO-ANCA), lung, or upper respiratory tract vasculitis have a higher risk for relapse that warrants longer maintenance therapy (52,53). However, in a randomized controlled trial of patients with PR3-ANCA disease who remained ANCA-positive at the time of stable remission, extending the duration of maintenance therapy with azathioprine from 1 year (followed by taper) to 4 years (followed by taper) was not associated with a significant difference in relapse-free survival at 4 years (54). The result of this study should not be extrapolated to other agents, and the optimal duration of maintenance therapy with rituximab has not been formally evaluated. Conversely, patients with none of the risk factors of relapse may not need an extended duration of maintenance therapy. Some patients with ANCA disease are refractory to induction of remission. In some studies, patients with PR3-ANCA are more likely to have refractory disease (53). Options for the treatment of refractory disease include the addition of plasmapheresis, or the addition of rituximab to a cyclophosphamide-based regime, or vice versa. In patients with very severe disease at the time of diagnosis, such as dialysis-dependent kidney disease with extensive glomerular scaring on renal biopsy, a decision to treat with toxic immunosuppressive therapy can be difficult. However, patients with ANCA GN with severe kidney failure at the initiation of therapy have a low but not negligible response to treatment. In a study of 155 patients with ANCA GN with eGFR<15 ml/min per 1.73 m2 at presentation, within 4 months after biopsy, 51% attained treatment response, 35% remained on dialysis, and 14% died (4). However, only 5% of patients who remained on dialysis after 4 months subsequently recovered renal function, indicating that continued immunosuppressive therapy is unlikely to benefit patients who are dialysis dependent for >4 months provided there are no extrarenal manifestations. Throughout the treatment of ANCA disease with immunosuppressive agents, the onset of adverse events must be monitored carefully, especially infections and cancer. In a retrospective study of 489 patients with ANCA disease receiving standard therapies, McGregor at al. observed 1-, 2-, and 5-year cumulative incidence of infection of 51%, 58%, and 65%, and severe infection was 22%, 23%, and 26%. Pulmonary and upper respiratory infections were most common, and Staphylococcus aureus was the pathogen identified most often in positive cultures (41%) (42). Prophylactic therapy that could decrease infection-associated morbidity and mortality should be considered in at-risk patients. Risk for developing cancer after treatment for MPA and GPA was 1.6–2.4 times higher than the general population in patients with MPA and GPA who received immunosuppressive therapy in the 1970s and 1980s, especially for bladder cancer and leukemia (55). In an analysis of >500 patients with ANCA vasculitis enrolled between 1995 and 2002 in four European clinical trials, cancer rates for immunosuppressed patients with MPA and GPA exceeded rates for the general population (1.58 for cancers at all sites, 1.30 for cancers at all sites excluding nonmelanoma skin cancer), but were less than the rates reported from earlier studies. The authors hypothesized that the smaller risk might reflect less extensive use of cyclophosphamide in recent treatment protocols. Prompt diagnosis and rapid initiation of effective treatment are the most important factors for optimum outcome in patients with ANCA disease. Prompt diagnosis requires an appropriate index of suspicion, familiarity with the broad range of presenting symptoms and signs, and the knowledge required to accurately distinguish ANCA vasculitis and GN from other forms of small vessel vasculitis and GN with similar presentations. Optimum treatment requires an understanding of the implications on treatment regimens of different serotypes, different clinicopathologic phenotypes, and different degrees of activity, chronicity, and severity. Current management strategies are superior to those in earlier decades because of more effective and more targeted drugs, and treatment regimens that are more personalized to the nature of the disease in individual patients. Ongoing advances in understanding ANCA disease mechanisms, and development of more effective, less toxic, and more targeted therapies, undoubtedly will lead to even better outcomes in the future. J.C.J. is on the unbranded speaker bureau for Genentech. Some of this work was supported by federal grant P01 DK058335-06 from the National Institutes of Health/National Institute of Diabetes and Digestive and Kidney Diseases. We thank Susan L. Hogan, Associate Professor, University of North Carolina (UNC) Division of Nephrology and Hypertension and the UNC Kidney Center, and Yichun Hu, Statistician, UNC Division of Nephrology and Hypertension and the UNC Kidney Center for the compilation and analysis of the data presented in Tables 2 and 3.